As we enter the new year, many homeowners are excitedly planning home improvements to upgrade the quality and enjoyability of their abodes. When it comes to home renovations, citizens have a wide range of options for how to best upgrade their place. Upgrading your home lighting system is one cost-effective way to make dramatic changes that are sure to illuminate your house in a spectacular way. Since 1984, the Lighting Corner has proudly provided the best outdoor and indoor lighting to Jenison homes, delivering quality products and expert advice to create truly stunning outcomes. We proudly serve West Michigan with our two lighting showrooms in Grandville and Grand Haven. Our representatives work hard to create top-tier lighting solutions to meet your unique style and budget. From dynamic, modern chandeliers to hanging light fixtures for every room, our huge inventory and decades of experience are sure to have you leaving one of our lighting showrooms with a smile on your face. Our passion for home lighting helps us to serve Michigan residents to the best of our abilities. Today, we’ll discuss the value of layering with your lighting scheme, as well as the support that our staff can provide for your different lighting needs. When you’re done reading this post, be sure to stop by one of our lighting showrooms to begin planning your project! When it comes to creating a successful lighting plan, many consumers make the mistake of not realizing the importance of layering with a variety of different light fixtures. Homeowners often rely on one or two lighting sources to cover the gamut of their house’s lighting needs, only to discover that their lighting scheme is not comprehensive enough to cover all of their needs. Across the lighting industry, many professionals have adopted the standard of having three different types of illumination for the home. Each type serves a very specific purpose and can have a major impact on the quality and comprehensivity of a room. Ambient lighting sets the tone for your room, covering it in light to allow inhabitants to see the room in addition to safely walking through it. Without quality general lighting, your lighting plan may fail to produce the results you want! Next time, we’ll continue this topic by discussing the remaining two types of lighting for your Michigan home. 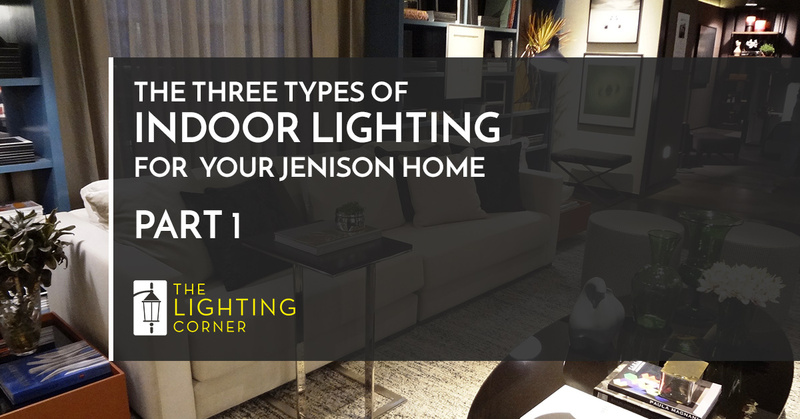 As Jenison’s indoor lighting experts, The Lighting Corner is proud to offer quality products and expert advice whenever it is needed to create stunning outcomes for each of our customers. If you are planning a lighting improvement project for your home but are overwhelmed by the sheer level of choices and styles, be sure to contact us today or stop by one of our expansive lighting showrooms!